On days like these you ensure you are at the dog beach by 6.30am. Scorching hot sand and blistering pavements on sensitive paws is not fun. The boy goes for a paddle and so do you. Sweeping floors, ironing, mopping and hoovering are out of the question, the only thing you are going to do with a brush on a day like this is paint your toe nails - maybe. You paint them because you will be wearing flip flops even though your ankles are a bit puffy. Getting ready takes longer as you need to lather up head to toe in Factor 30. Before stepping a foot outside, your handbag MUST contain all of the following items without fail. The session at the gym has never, ever been less appealing and you question your own sanity as you crawl out of the door on the verge of self combustion. Chilled water suddenly becomes far more delicious than any fine wine. If you are meeting a friend, you have to seek out a lunch venue with air con, here is perfect, you skip all carbs, aagh just the thought! You feel blessed that your home has high ceilings but the air con goes on anyway. You take at least 3 cool showers throughout the day but you can't dry your hair, even on cool the hairdryer makes your head perspire buckets. You are culturally challenged and bamboozled by the sight of Christmas decorations everywhere. You ensure there is a couple of tinnies in the fridge for the Hubster, then you make the salad and he throws some shrimp on the barbie. 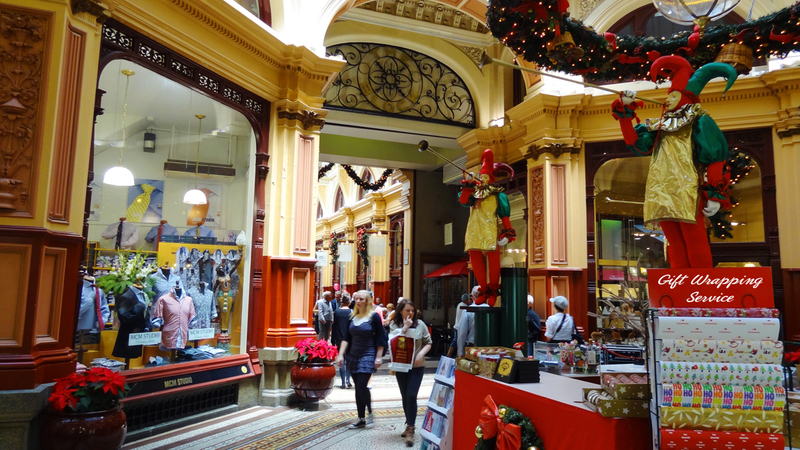 This is Summer at Christmas time Down Under!. 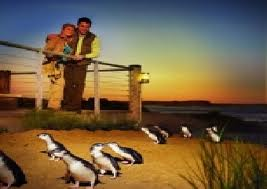 There is certainly more to Phillip Island than those wonderful Little Penguins. As we crossed the bridge leaving the mainland town of San Remo behind we both breathed a huge sigh. Open fields, rolling hills, cattle, sheep - SPACE....AIR....BREATH! We need this, from time to time we need to get away from the claustrophobia of the city, the impending walls of concrete that seem to make us feel so hemmed in. We headed towards Cowes, twinned with the one on the Isle of Wight and we were delighted with our weekend haven. It's quirky and we like quirky a lot. We replenished our depleted wine stocks at the Phillip Island Vineyard, far better we thought than the Purple Hen Vineyard which seems to get more press for some reason. Delightful Pinot Noir and a wonderful Blush were purchased after a leisurely tasting. We went up to the headland to The Nobbies (so called because the rocks protrude out of the water like nobs or stacks). Seagull breeding season was in full swing and full voice! I have to say even Seagull babies are pretty cute. It was quite a sight and stunningly beautiful. The furthest of the "Nobbies" is home to the biggest colony of Australian Fur Seals in the world about 6000 of them. We baulked at the $70 each price tag to go on a trip to see them and did it anyway. It really was worth every penny and the complementary afternoon tea and cake was a nice touch. Once again it was breeding season and seal pups were in abundance. Each area of territory was fiercely protected by a huge bull who would not tolerate any other male coming anywhere near his herd of cows. They will literally fight to the death rather than give up their girls! It was an incredible sight and a deafening sound however the acrid and pungent smell of ammonia from their feces was overwhelming. Every now and again you would get a huge waft downwind which sent you immediately for cover in the cabin. On our visit to the Koala Conservation Centre (fantastic value at just $11 each), luck was on our side once more. Koalas spend most of their time in the tree tops, sleeping for 20 hours a day and so are very difficult to spot. However, a few of the koalas had come down to the lower branches to feed and we had a great view. We were lucky to come across a wild Wallaby too, which appeared quite happy to sit and pose for us! One of the most surprising finds was the Vietnam Veterans museum. It was fascinating, extremely well done and very emotive. I was surprised to learn that Australian and New Zealanders fought in Vietnam too. Hollywood would have us believe it was only the Americans. For Hubster to spend nearly 2 hours in a museum is a first so it had to be good. All in all we packed a lot into our mini-break but we still managed to feel buoyed and rested. Of course we couldn't leave without that final seafood lunch of Tasmanian Oysters and Rock Lobster salad which we enjoyed at a fabulous restaurant called Shearwater, great food and lovely sea view. Phillip Island, what a gem, see you again in March 2013! A multi-faceted gem of a place just an hour and a half drive from home. It is only 26km long and 9km wide but it packs a lot in. In many respects it reminded me of our little county of Rutland back home, where the motto is "multum in parvo" - "much in little". It certainly could also apply here. One of the main attractions but by no means the only one, is the Penguin Parade. 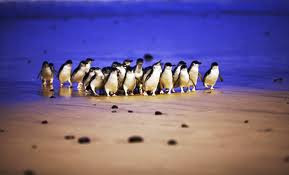 The island is home to a healthy colony of Little Penguins, the smallest of the 17 varieties in the world and the only place in the world where you will see them like this. We were not allowed to take any photos or video. I quite like that, 2000 flashing cameras would have been nothing but an invasion, so these pics are taken from archives. Each evening, after a long day fishing, these little 13 inch birds emerge from the surf and waddle up the beach into the dunes, to their burrows. Some of them have to walk 1.5km to reach their homes. It must be exhausting. Every break of the waves produces little pods of pengiuns that come in together until all 1500 eventually arrive. They seem to just appear from nowhere but never alone. 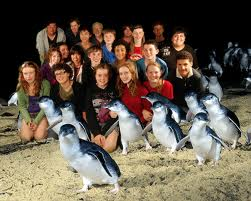 We were there at the perfect time of year as every burrow was occupied by one or two fluffy baby penguins. They were all eagerly awaiting the return of their parents, some were very impatient and left the safety of the burrow to stage a lookout and boy do they make a racket! It is amazing how every penguin recognises the call of their own and when they are reunited, the poor exhausted parents are mobbed and wrestled to the ground as the babies compete for their fare share of the day's catch. 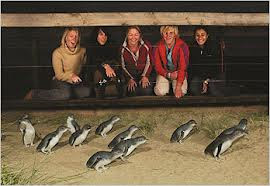 There were over 2000 spectators that night and the little penguins could not have cared less. They waddled about around our feet focused only on their journey home. Hubster and I were one of the last to leave, it was 10pm. "Come on now, time to go" said the Ranger "Lets leave the night to the penguins"
The TV documentary I had seen and been enthralled by back home just last year had actually come to life. We could hardly believe that we had just witnessed, first hand, one of nature's most rare and beautiful wildlife phenomena. 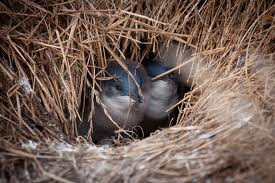 We left marvelling at these incredibly resilient little birds. They are so industrious that by daylight the next day, whilst we were still tucked up in our beds. they would have already made the journey back to the sea, just to do their parade all over again. Every now and again you have to be the tourist. With my cargo pants and bum bag secured around my waist, she said I looked every inch like one! Anthea and I took a trip into the City to go and check out the Old Melbourne Gaol. Looking at all the skyscrapers around us it was hard to imagine that the Gaol dominated the Melbourne skyline as a symbol of authority when it was built in the mid 1800s. Between 1842 and its closure in 1929 the gaol was the scene of 133 hangings including Australia's most infamous citizen, the bushranger Ned Kelly. Did you know that Mick Jagger starred in a film about Ned Kelly? Nor me, I just can't imagine it, he has never been known for his articulation, never mind the Aussie accent! Ned Kelly although deemed to be a vagabond and a murderous thief has now entered Australian folklore, much like a latter day Robin Hood. A wreath is laid beneath the rope where he was hung every remembrance Sunday and as you can see on the card, some now believe him to be an inspiration! The Gaol was very eery especially the practise of making a death mask of every prisoner that was hung. There was one method of "torture" used that we found particularly amusing, no pleasures were afforded in this prison, not even self administered ones! ahem! I'M A POMMIE, GET ME OUTTA HERE! The padded cell sent shivers down my spine and reminded me of that scene in the Green Mile. Prisoners would also hold "dirty protests" smearing excrement all over the walls, I am not sure what purpose this would serve but to make the life of the crowded cells even more abhorrent to the prisoners themselves. Doing her ablutions, Anthea looks like she is loving prison life! Naturally we were arrested, mischievousness was clearly our charge. Well why wouldn't be? Our mugshots have guilty written all over them. It was a really enjoyable afternoon and needless to say Anthea and I were the last to leave. We really love our Sundays. This week we were up early to the dog beach then a necessary trip to Southland shopping centre for work wear for Hubster. He is a "hit and run" shopper. Hit the shops and get the hell out of there. Hubster had a most satisfying win on the gees gees on Saturday and so we decided to blow most of our unexpected windfall on a sumptuous lunch. No need for the bikes, it is just 5 minutes walk from home. The Baths is a fabulous first floor restaurant affording great views of the sea baths, the bay and the city beyond. It's a cracker of a spot. We perused and pondered the menu with a glass of Janz Tasmanian Sparkling. We decided to go for the tasting menu, which by Melbourne prices, we thought was very reasonable. We didn't opt for the accompanying wines with each course though. That would have ended with an undignified stagger home I think. I took some pics of the food but was a bit hasty and actually had begun to tuck in before I remembered the camera. The Wagyu beef tartare was so delicious, I totally forgot about the pic. It was also a delight to see the delicious Cropwell Bishop Stilton on the cheese board, all the way from Leicestershire. By lunch time the dog beach is crowded. Definitely a good call to take the boy early and so lucky to live so close by. The tasting menu was hard to resist and I was keen to try a coddled egg and the mere mention of truffle and I am sold! 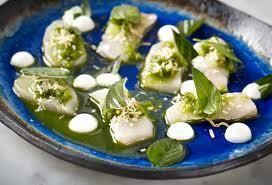 I know what you're thinking about that scallop dish! What a flaming bonkers combination, looks a bit messy on the plate too, I wasn't eating with my eyes on this one. However, the flavours worked brilliantly and turned out to be one of my favourite dishes. The salted banana ice-cream was delicious and the whole thing not too sweet. However, Hubster helped me finish that one off. The cheese platter came with a final flourish of home, the delectable Cropwell Bishop Stilton, served with quince jelly, spiced fruit chutney and dried muscatels. A truly wonderful 3 hour culinary extravaganza, with beautiful views and my favourite company in the whole world. Thank you Hubster and your brilliant win on the gee gees.